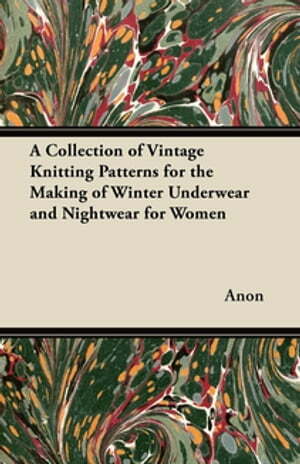 Collins Booksellers - A Collection of Vintage Knitting Patterns for the Making of Winter Underwear and Nightwear for Women by Anon., 9781473358218. Buy this book online. This book contains a lovely collection of vintage hand knitting patterns for the making of winter underwear and nightwear for women. With designs in different styles and sizes, there is something to suit every taste. Including such items as 'Argyle Socks', 'Fair Isle Slippers' and 'A Really Warm Bed-Jacket', this book is prefect for keeping warm and cosy throughout the colder months. The patterns are of varying difficulties, so this book should be suitable for most levels of knitting skill. The content has been carefully selected for its interest and relevance to a modern audience.